Bright barrel and ink colours! | Chisel tip for broad highlighting and fine underlining | Extra-large contoured barrel | Textured rubber grip for comfort and control. description_additional : Highlighter: Green, Orange, Pink, Yellow. 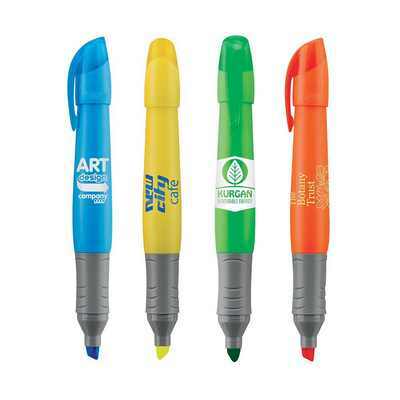 product_features : Bright barrel and ink colours! | Chisel tip for broad highlighting and fine underlining | Extra-large contoured barrel | Textured rubber grip for comfort and control. product_materials : Plastic. product_item_size : 22mm (W) x 140mm (H). product_packaging_inner : Bulk. colours_available_appa : Blue|Green|Yellow|Orange. decoration_options_available : Screen Print (SP). decoration_areas : Screen Print (SP): Barrel: 25mm W x 24.5mm H; max 1 colour. Price Includes : Plastic Pens.